Last month I hosted a photowalk on the Streets of America in Disney’s Hollywood Studios. It did not turn out exactly as people thought it would. I had planned a surprise but could not revel it until the time of the photowalk as it was not confirmed until a couple of hours before the meet was to start. You see, I had been in contact with a cast member at the Studios to arrange for special seating at Lights, Motors, Action Extreme Stunt Show over the last few months. The problem was the weather as it was raining hard, as in Cats and Dogs hard, until about two hours before the Photowalk was to start. Turns out as long as it is not raining, the show would go on at a slower pace for safety. I collected my group of 6 people who took a chance on the weather and we headed over to the Lights, Motors, Action Extreme Stunt Show entrance where we meet up with the cast member. He escorted us up to the VIP Seating area which is directly behind and above the show’s control room. From there we had a clear view of the Lights, Motors, Action Extreme Stunt Show “stage”. Four more people joined us late bringing the group to 10 people. AllEars.net Streets of America Photowalk participants in Disney’s Hollywood Studios. Nikon D700/28-300VR, 1/160s, f/8, ISO 200, EV +0.3, 28mm focal length, fill flash. 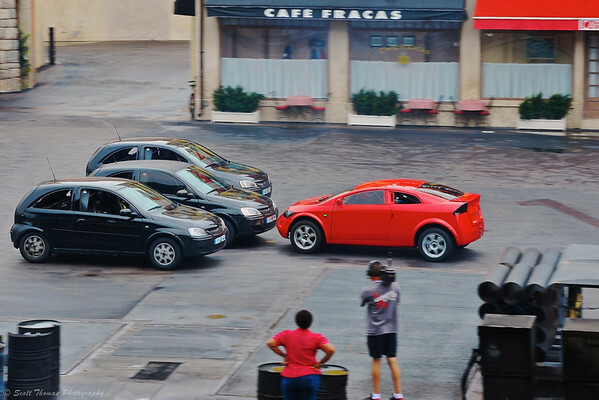 Here is a photo I took during the Lights, Motors, Action Extreme Stunt Show from the VIP Seating Area when the red Hero car comes nose to nose with the Villain cars while driving backwards. I pointed out when and where the action would be taking place to those who had never seen the show before. The Hero going nose to nose with the Villians during the Lights, Motors, Action Extreme Stunt Show. Nikon D700/28-300VR, 1/125s, f/10, ISO 200, EV 0, 105mm focal length. Another action scene this time using a faster shutter speed to freeze the action. 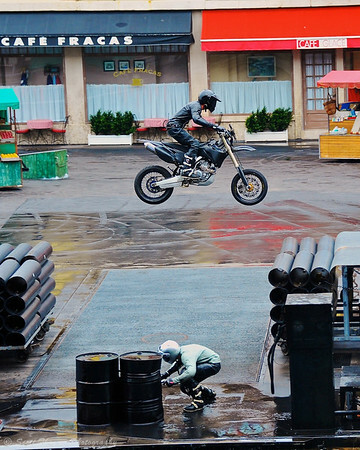 Villian motorcycle jumps over the Hero during the Lights, Motors, Action Extreme Stunt Show at Disney’s Hollywood Studios. Nikon D700/28-300VR, 1/1000s, f/5.3, ISO 900, EV +0.3, 92mm focal length, cropped. I found out before the show my group was invited to a backstage tour of the Lights, Motors, Action Extreme Stunt Show set. After the show ended, I gathered everyone up and meet one of the ushers at the bottom of the stands. He walked us over to a stage entrance where we were greeted by two of the stunt drivers. What a surprise to all of us (including me) that they would be giving the tour. Rob and Chad took us behind the town’s facades where we got to see all the cars, motorcycles and other stuff stuff for the show. We even got a chance to get behind the wheel of the Hero car. Let me tell you it is a tight fit! I got to sit in the red Hero car while backstage at the Lights, Motors, Action Extreme Stunt Show. 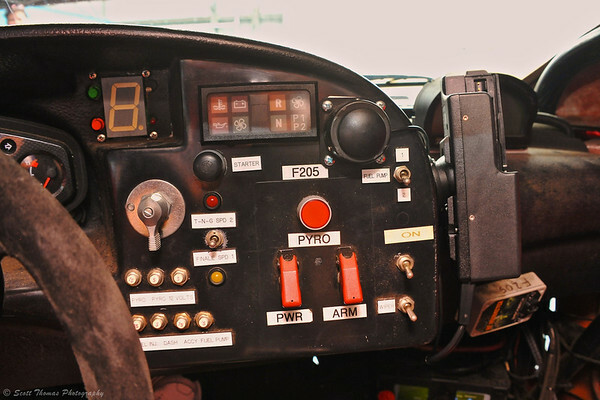 Here is the car’s dashboard which includes a Pyro button. Wonder how much that option costs? Nikon D700/28-300VR, 1/60s, f/8, ISO 2200, EV +0.3, 28mm focal length, fill flash. The stunt drivers were perfect hosts answering all of our questions while showing us around. Did you know they use 3,000 tires a month and the bumper of the Hero car is replaced twice a week? They showed us the cleanest auto shop I have ever seen where they can fully take the cars, motorcycles and jet skis apart and rebuild them. Rob and Chad posed with us for pictures. This is Rob below with a young Photowalk participant. 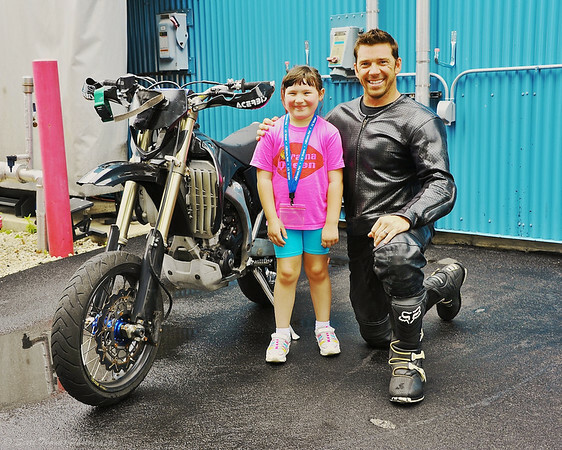 A young Photowalk participant poses with a stunt driver backstage at the Lights, Motors, Action Extreme Stunt Show. Nikon D700/28-300VR, 1/60s, f/8, ISO 200, EV +0.3, 45mm focal length, fill flash. I can not thank the cast member enough for arranging both the VIP Seating and the Backstage Tour. It was a thrill for all of us and made the day extra magical. After saying our goodbyes to Rob and Chad and thanking them with the AllEars.net trading card for the Lights, Motors, Action Extreme Stunt Show, we went over and explored the Streets of America. I gave everyone 10 hints of interesting things to find. You can see those hints and the photos by some of the photowalk participants at the AllEars.net Streets of America Photowalk Online Gallery by clicking here. Feel free to leave us comments about them. We caught the end of a performance by Mulch, Sweat and Shears on San Francisco street. The guitar player was really into it. Sure capped off an amazing photowalk for us. 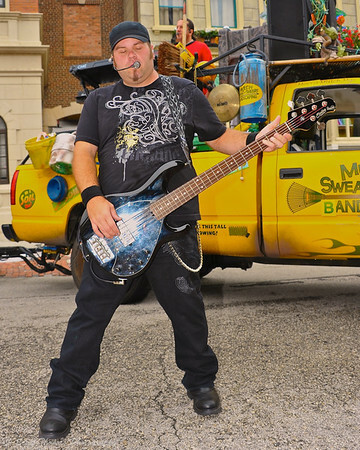 Mulch, Sweat and Shears guitarist performing on the Streets of America in Disney’s Hollywood Studios. Nikon D700/28-300VR, 1/160s, f/6.3, ISO 200, EV 0, 28mm focal length, fill flash. What a great group of people who took a chance and came to the photowalk even though the weather was far from ideal. I encourage you to check out the photo gallery (see link above) as the crew did a very good job of capturing the fun and excitement of the day. I hope to see some of you at a future photowalk. This entry was posted in Photography and tagged 28-300mm, black, cars, disney's hollywood studios, florida, guitar, hero, jump, live, motorcycle, nikon D700, orlando, red, show, streets of america, stunt, villain, vr, walt disney world. Bookmark the permalink. 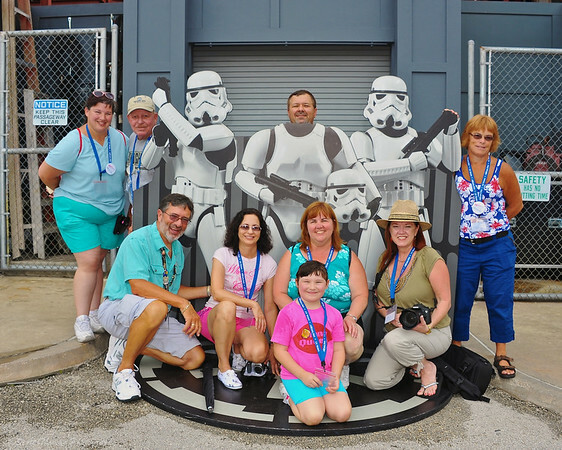 What a fun surprise for your photo walkers! Isn’t it amazing what you can get at Disney simply by asking? This cast member has helped other photo groups at the Studios. He’s mostly in the background these days so he enjoys any opportunity to get out into the park to meet and interact with guests like us. So cool Scott!!! 🙂 Sounds like you had a great time!